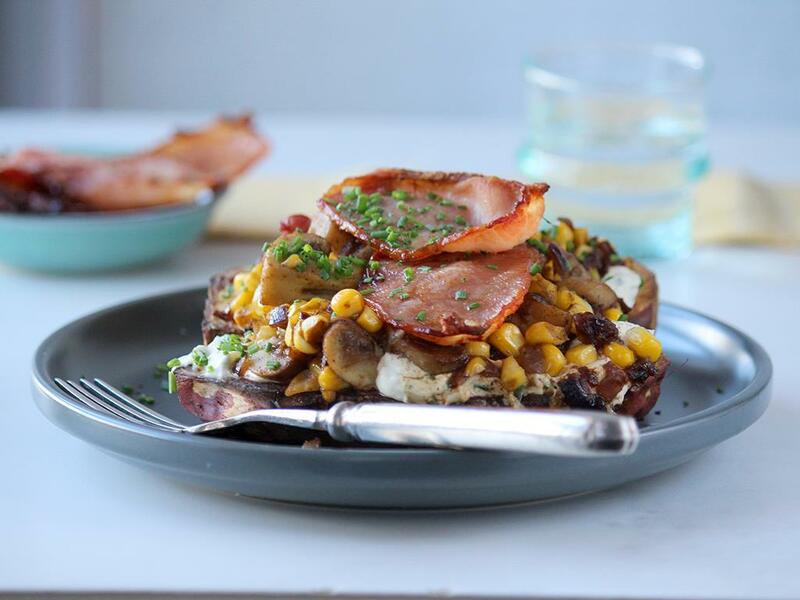 Golden roasted sweet potatoes topped with veggies, cream cheese & chives & crispy bacon. Roast sweet potato & bacon: Cut the sweet potatoes in half lengthways, then make shallow diagonal slices in the flesh one way, and shallow diagonal slices the other way to make a crisscross pattern. Drizzle with olive oil, season with salt and pepper and roast for 30-35 minutes until golden brown and cooked. In the last 15 minutes, add the bacon to the same tray in a single layer and roast for 15 minutes until golden. Mushroom & sweetcorn: Place a pan on medium-high heat with a drizzle of olive oil. Add the onion with a pinch of salt and sauté for 5 minutes before adding the ground cumin and mushrooms. Cook for 3 minutes, then add the corn and sauté for 5 minutes until slightly golden and cooked. Season with salt and pepper. Serve by mixing together the cottage cheese and HALF the chives and spreading it over the flesh of the sweet potato. Top with the mushrooms, sweetcorn and bacon and sprinkle over the REST of the chives.